Tannoy Mercury 7.2 review | What Hi-Fi? For those versed in Roman mythology, the name Mercury may bring to mind the God of communication, so on the face of it, a good name for a pair of speakers. Unfortunately, more relevant to these Tannoys is the planet named after him, in so much as it’s far from the best hi-fi on Earth. That’s perhaps a tad harsh but given our admiration for the company’s usual output - such as the Award-winning Eclipse 3 speakers - the Mercury 7.2s are disappointing, mainly because we’d expect so much more. 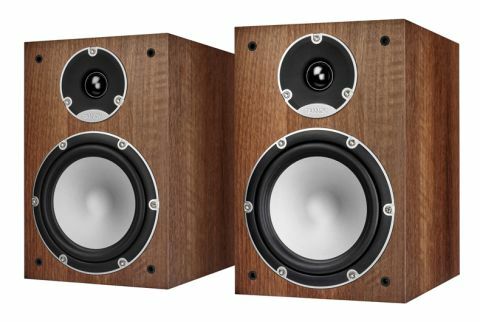 They’re an attractive unit; a diminutive, 9.4-litre wooden box finished in walnut (our review pair and personal preference too), light oak or black oak, each flaunting a 28mm soft dome tweeter and 15cm midrange driver to the front and passive reflex port to the rear. The Mercury 7.2s are unassuming but smart at the same time: a magic combination for budget bookshelf speakers. The build quality doesn’t entirely match, however. At this price the Mercury 7.2s could feasibly be a component in your first hi-fi setup, but £230 isn’t by any stretch a trivial amount, and the first impressions are that it doesn’t feel like you’re getting a steal. The reflex ports, for example, already feel loose as we’re picking the speakers up out of the box. There are speakers such as the Monitor Audio Bronze 2 or Q Acoustics 3020 that feel higher-end than this. But that doesn’t necessarily amount to poor sound, which is, after all, what matters most. And when we plug these Tannoys in to feed them Explosions In The Sky’s The Wilderness, we are somewhat comforted by the relatively detailed, easy to listen to performance with which we’re presented. There isn’t oceans of space, though that’s neither a surprise nor a major criticism given the Mercury 7.2s’ stature, but the detail is enough that we can pick out the instruments as textures build and don’t feel we’re lacking any parts. It’s easy on our ears, as well; we don’t pick out any coarseness that would make listening strenuous, even when arrangements reach their crescendo. The balance in general is a bit off, though. There’s a fair bit of bass, though it isn’t extremely taut, and the treble is equally prominent, but it creates a crevice in which the mid-range tends to hide somewhat. It’s more noticeable when switching to an album with vocals, such as Fleet Foxes’ Helplessness Blues; where we ought be experiencing luscious harmonies, the feeling is that they’re lost, shadowed by upper and lower frequencies. Most disappointing, though, is the Mercury 7.2s’ sense of timing and dynamics. It isn’t confusing, nor does it make rhythms difficult to track, but it’s flat. There’s little real momentum or expression, which leaves the performance feeling quite cold; there are no swells, no impetus on beats or picking patterns. If you’re after a pair of speakers to power a party, these probably aren’t them. We’ve been reasonably satisfied listening to the Tannoy Mercury 7.2s, and while there are aspects of their performance we admire, we’re not moved to finger through our music library as we would be if we were really enthused by what we were hearing. If you want something small for some easy listening, there might be a place for these Tannoys on your shelf. Otherwise, there are plenty more talented options on the market - and plenty that’ll save you a bit of cash to boot.